As the largest drone developer and manufacturer in space, CreoDron has a vested interest in drone carriers but has recently began to expand their design focus and employ drone techniques on whole other levels which has lead some to question where this leap in technology came from. 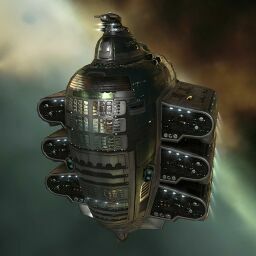 The Anshar is the Gallente Jump Freighter. Unlike its more mundane brother, the Obelisk, the Anshar has an onboard jump drive, similar to the one on a carrier or dreadnaught. This makes it much more popular among null- and low-sec alliances, where having a regular freighter make the trip would be too risky to attempt. Further information about additional or recommended skills to pilot Anshar for a specific or it's common role(s) can be written here. No sub-article about Anshar roles or piloting tactics. You can write them here. You can write additional notes for Anshar here. This page was last modified on 31 December 2016, at 11:06. This page has been accessed 47,261 times.